Iowans needed a legislative session that worked to raise family incomes and expand educational opportunity. Iowans had long demanded water-quality measures and accountability to scale back reckless tax breaks. Instead, lawmakers offered a litany of suppression — of wages, voting rights and workplace fairness. Legislators' attack on the Leopold Center at Iowa State University and other established scientific research came as a surprise. Read about this potential lost legacy. As legislators did before him, Governor Branstad put ideology and spin over substantive discussion, collaboration and fact as he signed legislation that repealed predictability for low-income workers' paychecks and introduced fresh confusion for workers injured at work. 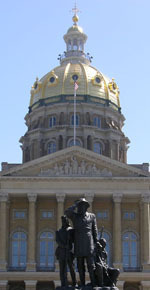 In a legislative climate that increasingly bars local elected officials from protecting the health and financial security of Iowa residents, the means for individuals to respond on their own is threatened as well. The latest area: individuals challenging animal feeding operations in court. Devastating consequences could be predicted before Iowa lawmakers and the outgoing Governor pursued dramatic changes to Iowa’s public sector collective bargaining law.